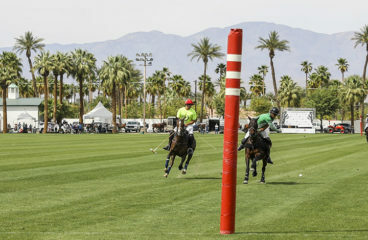 Enjoy a five-star polo playing experience at the beautiful Empire Polo Club, located in Indio, California. Fun parties, affordable polo, immaculate fields and a world-class equestrian facility make Empire Polo Club the perfect winter destination for polo players and their families. Boasting 12 grass polo fields, a regulation-sized polo arena, two exercise tracks, both polo and hunter/jumper stabling, the Tack Room Tavern Restaurant, and the Date Shed Night Club—Empire Polo Clubs has something for everyone. 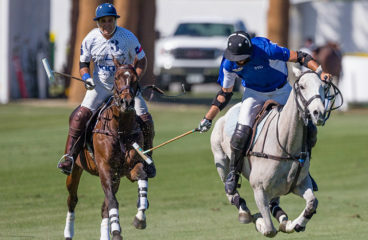 Empire Polo Club’s winter season begins in December with pre-season weekend tournaments. The main season starts in January and continues through the first weekend in April and offers 1-goal, 4-goal and 8-goal leagues. 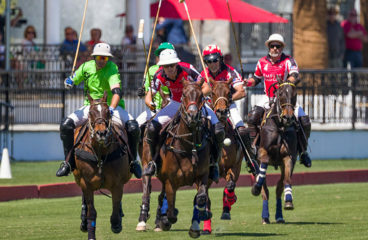 Polo games are open to the public and spectators are invited to attend. Sunday Polo kicks off with Opening Day and Hat Day in early January, with weekly featured matches at 12:00pm and 2:00pm. Tailgating and general admission are free with a $20.00 parking fee. VIP seating is also available for an additional fee. If you are interested in learning how to play polo, the Los Angeles Polo Training Center & Polo School is located on property at the Empire Polo Club. The school offers group and private lessons, as well as a coaching league and junior polo program during the winter season, December through March. Make Empire Polo Club your winter polo destination. PACIFIC COAST CIRCUIT GEORGE S. PATTON JR.
La Herradura - Santi Torres, Carlos Hernandez Perez, Catlin Dix, Meghan Gracida. PACIFIC COAST CIRCUIT GENERAL GEORGE S. PATTON JR.
Spindrift - Leslie Tims, John Bickford, Juan Curbelo, Luis Saracco. Evergreen (L to R) Tom Sprung, Bayne Bossom, Juan Jose Gonzalez, Carlos Galindo Jr.
Kahuna owned by Carlos Galindo Jr.
2017 Pacific Coast Circuit George S. Patton, Jr.
Maryland - Maddie Grant, Sophie Grant, Catie Stueck, Abbie Grant with Coach Kelly Wells, and USPA Girls National Interscholastic Championship trophy donors, Mr. and Mrs. Colhoun. The iconic polo sign on Field 1. Players ride off on Field 1. Spectators fill both sides of the sidelines during Sunday Polo. Drone image of Sunday Polo on Field 1. The olympic-peaked tents and VIP area on Field 1. Sunday polo in front of a crowd of spectators. Polo pony at the trailer. Polo at the beautiful Empire Polo Club. Comfortable sofa seating lining the field. Arena polo at Empire Polo Club. Player charges down the field.